Most of us coffee drinkers do not really appreciate how we get our favourite brew at prices that are only sustainable in a world that accepts the poverty that the coffee is grown in. To use Konrad Brits words "grown by the poor drunk by the rich". Although we at Quaffee have only been just dipping our toe in the relationship and coffee direct trade market, we believe that the price even we pay only covers basic costs. The C-Market is a joke, the only countries that are able to produce bulk coffee at that price are Vietnam and Brazil and even there wage increases are putting pressure on the large growers. Any way this post is about an article that appears in the latest Roast Magazine (September/October 2015). This article is on the CoE reward and auction and its real impact on the producers. Just take a look at the graph they have in the article (I hope the do not mind we dumping it here, if they do I will have to remove it). 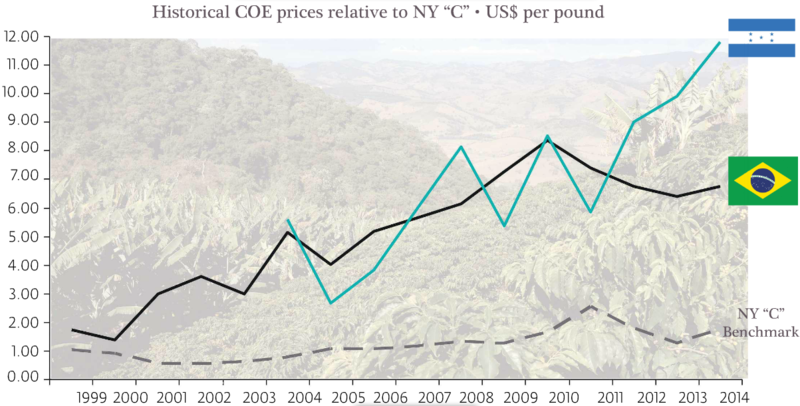 The graph compares Honduras and Brazil average prices achieved in the CoE auctions and it is quite staggering the difference in prices being achieved. The dotted line is the traditional commercial or C price. It is time for us as coffee drinkers to be more responsible and support programs like these. Get the magazine and read the article it is a good read, in fact if you love coffee and coffee roasting there magazine we believe is a de facto requirement.